Former Coronation Street actor and one-time pop star Adam Rickitt has spoken of battle with hair loss and newfound confidence after restoring some of his locks, following a combination attack on his hair loss using Minoxidil, taking Finasteride, and trying laser therapy. Adam was a huge heartthrob back in the late 90s and early 00s and had girls up and down the country swooning over him and his blond curtained style hairdo. Over the years however, the 40-year-old has ditched the curtain look and more recently has been sporting his natural brown-coloured hair closely cropped. The now-Hollyoaks star (playing schemer Kyle Kelly) has clearly taken action to prolong his glittering career in television, fearing that losing his hair could lose to losing TV roles too. “If I’d left it, it probably would’ve ended up going bald or very thin. From a career point of view it would have restricted some of the roles I could do. From a personal point of view I would have been a bit gutted. I’m not going to deny it,” he commented when discussing his dilemma. Instead, Adam opted to take Finasteride tablets, apply Regaine for Men and try laser therapy at the MHR Clinic, part-owned by Wales Football Manager Ryan Giggs. The actor went for weekly 40 minute laser sessions and also took zinc, milk thistle and saw palmetto supplements in an effort to restore his hair. October 24, 2013 -- Celebrity hair loss stories: The bald truth uncovered! October 10, 2012 -- Revealed: the everyday pills that could cause you to suffer hair loss! 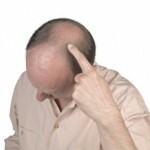 April 5, 2013 -- Could male hair loss be connected to heart problems? August 2, 2017 -- Magic Mike Star Channing Tatum Suffering with Hair Loss? September 14, 2012 -- Hey Jude, don’t make it bald! This entry was posted in Hair Loss, Male Hair Loss Treatment, Skin & Scalp and tagged Adam Rickitt, adam rickitt hair loss, celebrity hair loss, finasteride, minoxidil, regaine. Bookmark the permalink.